← Chocolate walnut and maple inside with a cherry outside .. 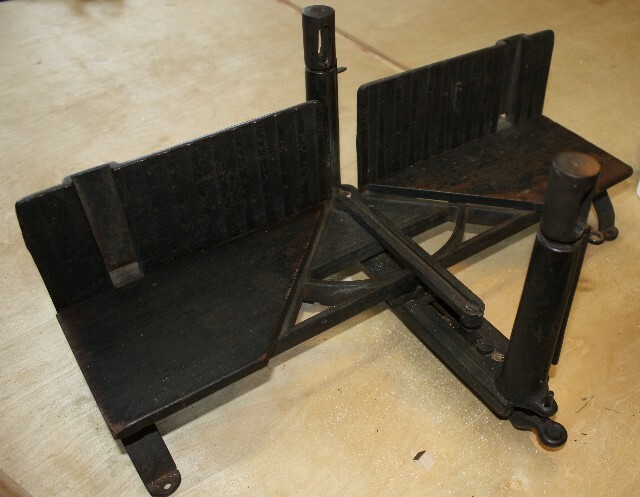 I bought this saw on Ebay because I think I can make cross cuts by hand instead of on the table saw. And .. I want to be able to miter accurately as well. I chose this one because .. well .. it looked well used and cared for AND because I want to use it. Collecting doesn’t do much for me. So what and how much to clean and repair? First, there’s a small crack in the frame and the back foot is broken off. Some one recommended JB weld to fix these item (since I can’t weld nor do I have the equipment). I do, however, have a friend who welds although he’s new to it. What’s the best way to repair the crack? I was thinking “spot weld” on the back side of the frame. 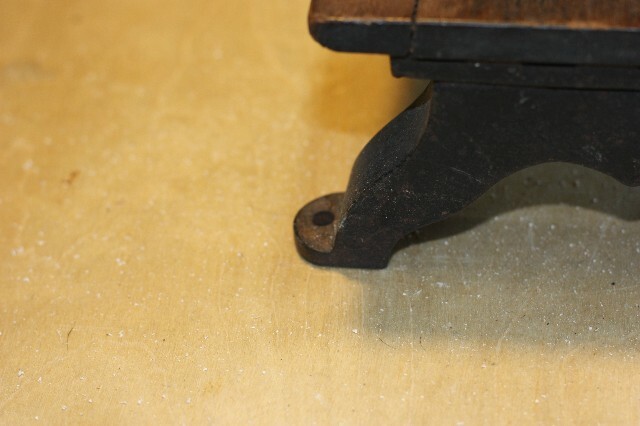 Should I have the foot rebuilt and if so, any suggestions on how to do that? Cleaning. There doesn’t appear to be a lot of rust just a layer of greasy black “something”. Maybe its original paint or added later paint. Should I clean it or just leave it. Thoughts on assessing and lubrication the saw holding mechanism. It works fine as is, but I want to make sure it stays that way. This entry was posted in mitre box, tool repair. Bookmark the permalink. Does the crack flex in use? If it doesn't JB would make a decent filler, but I don't think it does very well under stress. Brazing would be my first choice, with a little research you could do it yourself with MAPP gas and brass filler.The foot I'd make in wood. I wouldn't invest too much in a repair. Fine, thanks Blogger… delete the end of my comment. 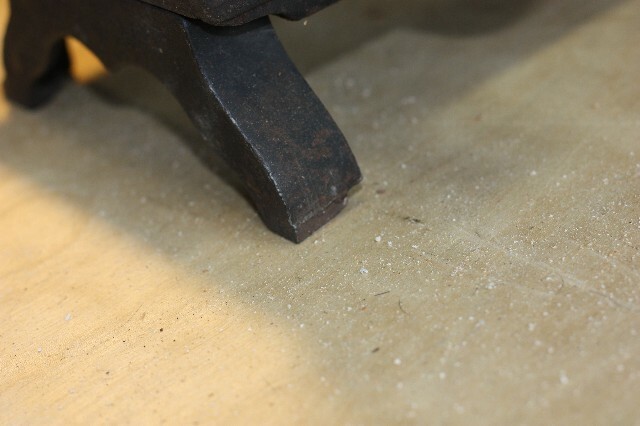 I can't help with the metalwork, but I did a post or two on a miter box that I brought up to speed in my shop (http://combraystudio.blogspot.com/2010/12/sunday-toolfoolery-hot-rodding-stanley.html). A year or so later, it is still a workhorse. Good luck! Eww!Bead blastin, thad be cool. I see what my welding friend has to say. Thanks for the ideas. I'm temped to repaint so that it doesn't deteriorate any further. It works well and I'm jazzed about that. The cuts I've made so far are super straight. I need to get it cleaned up and put back together so that I can get a solid base for it. Excellent! Thanks for the post link. That's a very clever way to hold the work. Wooden cams. I hadn't found that yet. Nice lookin' mitre box too! Hi Marilyn,Is the table metal or wood on that? Looks like it's the all metal langdon – is that right?Cleaning: If it's greasy or oily I'd use something to clean that off first — soap and water, lacquer thinner, simple green, or if it's really nasty either Easy Off (oven cleaner) or engine cleaner from the auto parts store. I used Easy Off to clean the frame on my '56 Studebaker pickup and it cut through 60 years worth of undercoating and grease.Then I'd bead blast it, I have 220x glass beads in my cabinet and they leave a nice finish. Any surfaces that you want to have a "smooth metal" finish would need a little hand sanding with 220 and 320 grit sandpaper. For paint it perfect already.On the cracks I'd probably TIG Braze it. First the cracks need to be slightly V'd out, then lay in a bead of Silicon Bronze rod and grind/file flush. Except for the color difference it should be pretty much invisible. 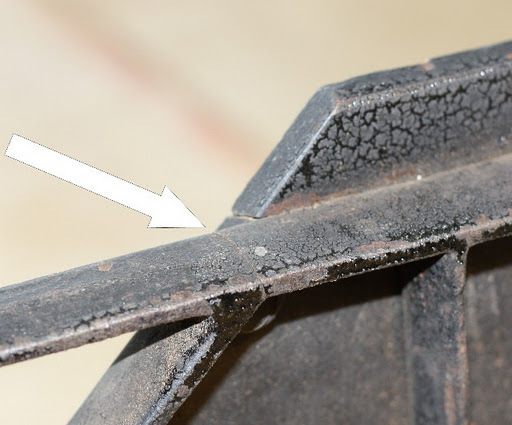 Cast Iron is weldable, but it's prone to cracking when it cools. 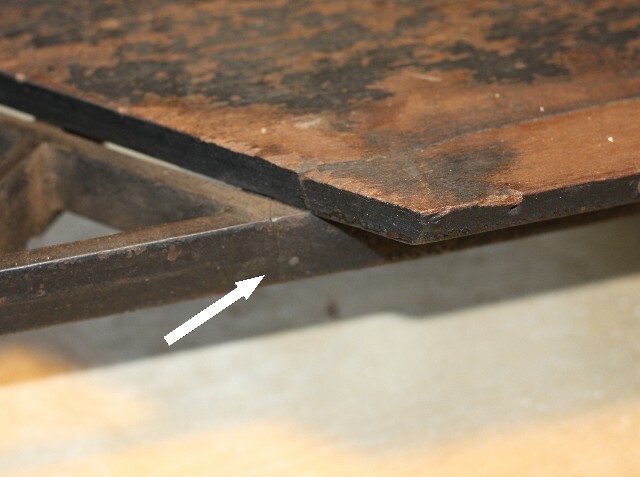 You avoid that with the Silicon Bronze as you use less heat.The foot can be repaired, I'd probably cut a tab out of steel and TIG-braze it on.If you disassemble and de-grease it, and send it to me I'd be happy to bead blast and weld it. Won't take an hour start to finish.JoePS: is anyone else having trouble commenting using their wordpress login on blogger? The table is wood and yes, its supposed to be a Langdon although there the only identifying marks I could find are a N and L stamped in the frame.